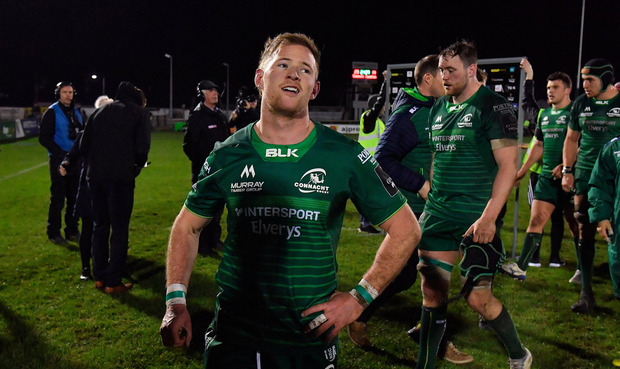 The 26-year-old couldn’t have scripted it better as he came off the bench to edge Connacht back in front after they had surrendered a 14-0 lead and then he set up the clinching try for Matt Healy. But Carty’s eye-catching cameo didn’t end there as he crowned the win by getting the bonus point in the final play with a converted try that saw him surpass Ian Keatley as Connacht’s all-time top scorer. Initially Benetton did enough to repel them and looked set to survive when Tiernan O’Halloran was stopped short, but James Cannon did enough to force Duvenage to spill the ball behind his own line and Healy pounced to touch down, with Godwin converting for 14-0. Benetton hit back to level after 55 minutes through Duvenage but the arrival of Carty turned the game back in Connacht’s favour and the home side secured a valuable win. Connacht – T O’Halloran (S Fitzgerald 38, HIA); D Leader, T Farrell, P Robb, M Healy; K Godwin (J Carty 57), C Blade (K Marmion 57); D Buckley (P McCabe 60), S Delahunt (T McCartney 52), F Bealham (C Carey 62); U Dillane, J Cannon (G Thornbury 57); E McKeon, C Fainga’a, J Butler (E Masterson 71). Benetton Rugby – L Sperandio; R Tavuyara, T Benvenuti (T Iannone 65), A Sgarbi, M Ioane; I McKinley (A Rizzi 31), D Duvenage; N Quaglio (D Appiah 51), H Faiva (T Baravalle 31), M Riccioni (T Pasquali 67); I Herbst (R Barbieri 68), A Zanni (M Barbini 51); M Lazzaroni, G Pettinelli, T Halafihi. Ref – M Adamson (Scotland).